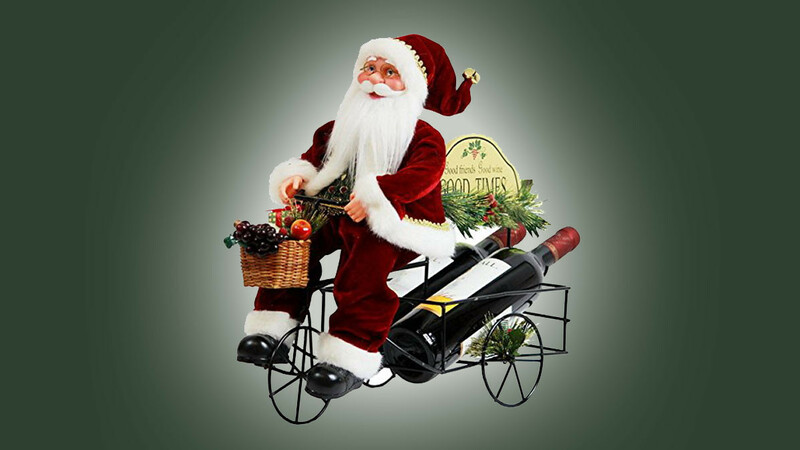 This seasonal Santa Claus holiday wine rack is perfect for any festive get-together. It features Santa bringing two bottles of the good stuff in the back of his sleigh. The entire rack measures 17 x 15 x 8 inches and the tricycle style sleigh is made of metal. This is a great holiday decoration or a cool way to present bottles that you are gifting to someone special. There is a sign on the back of the tricycle that reads Good Friends Good Wine and Good Times. You don't have to use it to hold wine because you can fill the back of the sleigh with almost anything.